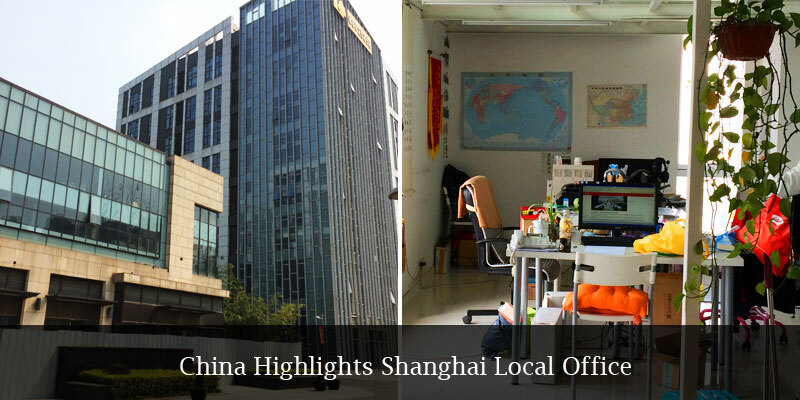 On this day you will explore in depth some hidden gems of Shanghai with the tour guide. 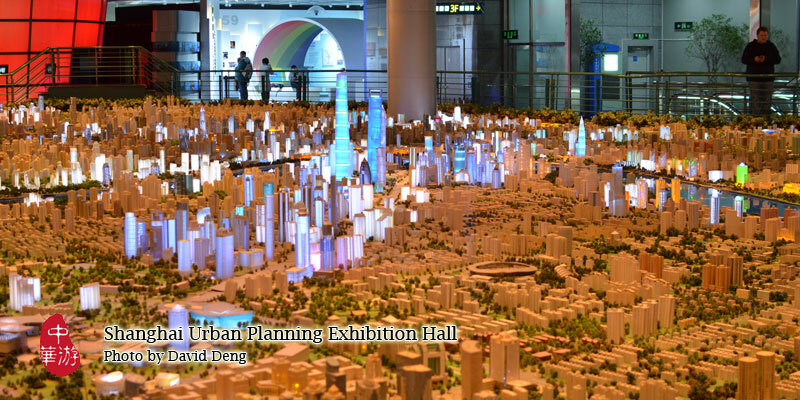 First, you will visit the Shanghai Urban Planning Exhibition Hall where you can see miniatures of all 6000 skyscraper buildings in the city and gain your own bird’s-eye view of the city’s history and exciting future. You can see The Bund in charming miniature and see its position in the city. 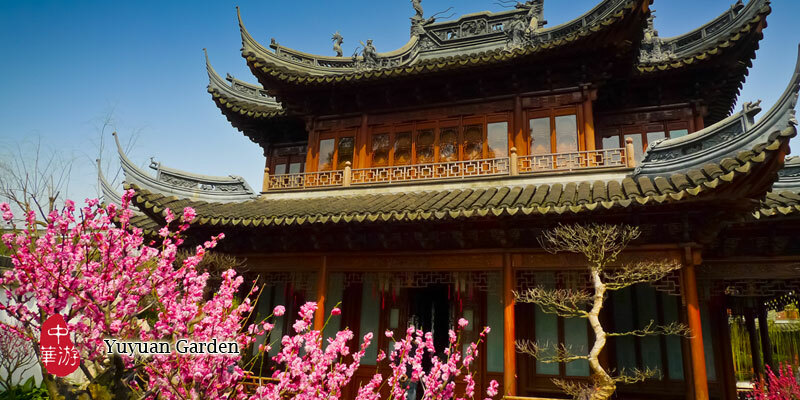 Then you will visit the City God Temple and the adjacent and beautiful Yuyuan Garden, a private garden built for the well-connected Pan family, over 400 years old, dating back to the Ming Dynasty. After a sumptuous meal at a local Shanghai restaurant, you can feel free to take a walk around the nearby bazaar. Then our guide will take you to Xintiandi, built on the remnants of Shikumen, once mid-19th century stone-built houses, now home to a cornucopia of cosmopolitan cafes, book shops, restaurants and boutique outlets. This is the former French concession, where Chinese and Western culture and architecture are perfectly blended. After a pause to unwind, you will take a river cruise on the Huangpu, to see clearly the amazing contrast between old and new buildings in Shanghai as they pass by. Finally, you will be driven back to your hotel. A visit to the Shanghai Urban Planning Exhibition Hall. Imagine the future development of Shanghai via the wonderful three dimensional displays and miniatures of 6000 skyscrapers. A time to stretch your legs and satisfy your curiosity by walking around the warren of streets adjacent to the Yuyuan Garden, hosting a variety of shops selling everything from clothes, to food, souvenirs, curios, gems and the genuinely eye-opening and bizarre. A stroll along the avenue in the former concession area that blends Chinese and Western structural styles; take in the unique architecture in Shikumen. Take a 40-minute cruise at around 6 pm, when the buildings on both sides of the Huangpu River are lit up, and see some fabulous sights – 19th century architecture on one side rubbing shoulders with 21st century skyscrapers on the other. Your guide will be waiting for you at your hotel lobby and a comfortable car will transfer you to your first stop of the day. This huge hall displaying miniatures of the city is an amazing place to visit. You can see the modern skyscrapers currently in existence as well as those planned for the future. Under the theme “City, Humanity, Environment and Development", urban planning is an interesting and engaging topic throughout the world, relevant to city dwellers from any country. This unique glimpse of the present and future Shanghai can provide much food for thought, as well as enjoyment and a good overview of this often overwhelming city. Yuyuan Garden was first created in 1559 during the Ming Dynasty by Pan Yunduan as a private oasis for his father, the minister Pan En, in his dotage. Pan Yunduan began the project after failing one of the imperial exams, but his appointment as governor of Sichuan delayed construction for nearly twenty years until 1577. The garden was the largest and most prestigious of its era in Shanghai, but unfortunately its great expense helped bankrupt the Pans. The ticket office of the Yuyuan Garden closes by 4 pm, the reason why China Highlights takes you there in the morning to ensure you have plenty of time to view this elegant masterpiece of Chinese private gardens and enjoy its calm environment. Sansui Hall – a 12-meter-high rockery made of huangshi stone , featuring peaks, cliffs, winding caves, and gorges. This scenery was possibly created by Zhang Nanyang during the Ming Dynasty. Dianchun Hall – Heralding Spring Hall, built in 1820, the first year of the Daoguang Emperor. It served as the base of the Small Swords Society from September 1853 to February 1855. Yuhua Hall – Jade Magnificence Hall, furnished with rosewood pieces from the Ming Dynasty. It shares its name Yuhua with a mountain near Xinye in Zhejiang. City God Temple – "You&apos;ve never really been to Shanghai if you haven&apos;t visited the City God Temple (Chenghuang Miao)." This quote explains concisely the status of the City God Temple. 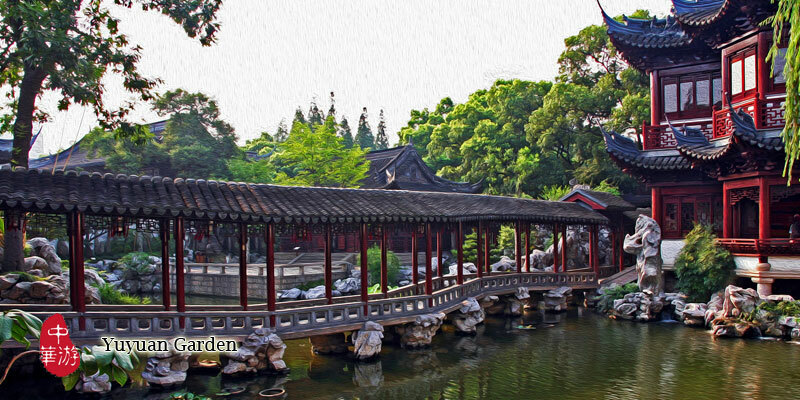 It sits adjacent to, and is easily accessible from the Yuyuan Garden itself. Its range of delicious and diverse dishes and snacks attracts numerous visitors every day. 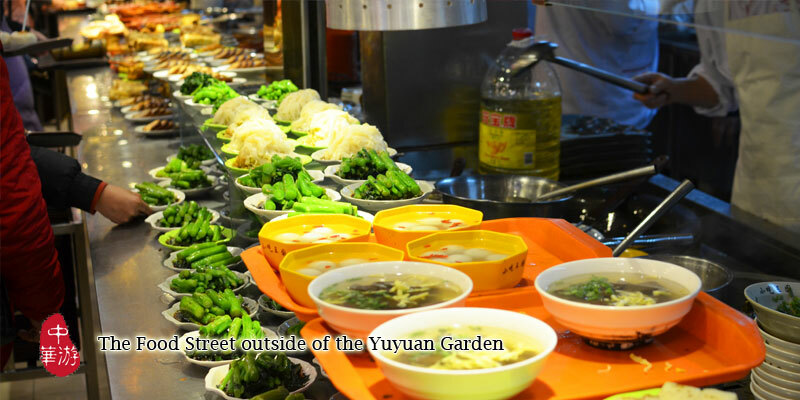 Wander around at your leisure in the warren of streets hosting a variety of shops near the Yuyuan Garden. 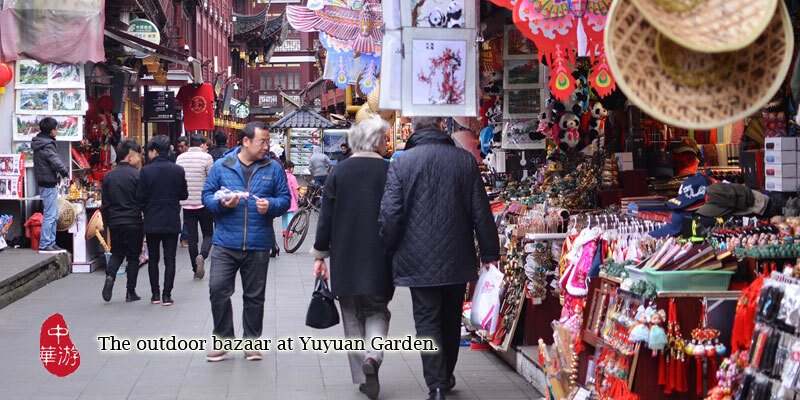 The outdoor bazaar at Yuyuan Garden sells various souvenirs, arts and crafts; the Cultural Street Market on Fuzhou Road, the Antique Street Market on Dongtai Road and the clothing street market on Shimen Road are traditional open-air Chinese markets. Walking around the bazaar makes you feel like you’ve gone back in time, as the area is liberally and colorfully decorated with Chinese lanterns and with animated life-sized figures (clockwork fantoccini) representing traditional Chinese lifestyle. Here, you can pause and have a taste of some interesting and typical Shanghai street food, while you take in the sights. 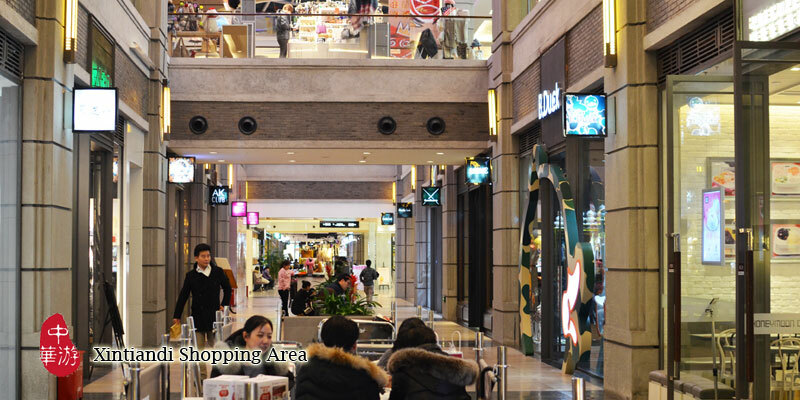 From the bazaar you will be transferred to the Xintiandi area, 20 minutes’ drive away. Your guide and driver will take you to Xintiandi — this is a must-see place you should find time to include when visiting Shanghai. Xintiandi is famous because of its history and ancient beauty. Art exhibitions and other cultural activities are often organized to attract tourists and locals alike. Historic buildings and streets have been extensively renovated over time, which sometimes makes it hard for people to see what is original and what is new. It is recommended you take a seat and decide which is original and which is new over a cup of coffee after your walk . From Xintiandi, you will be transferred to the pier at Huangpu River, also 20 minutes’ drive away. 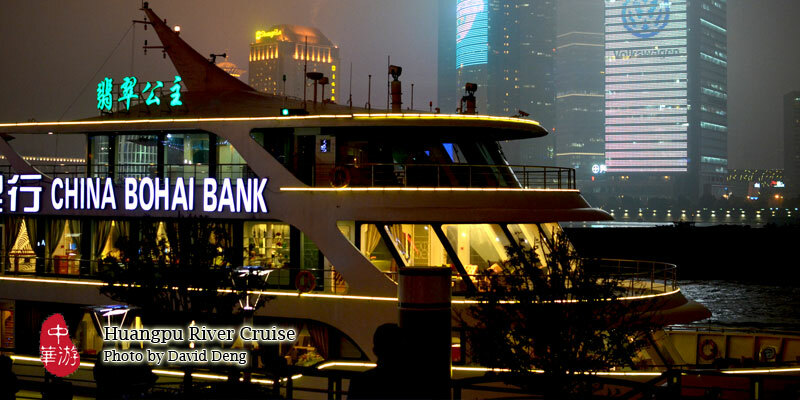 Your cruise on the Huangpu River is timed for 5.40 pm as we want you to experience the unmissable sight of the city as the sun sets. You will see some fabulous sights as the buildings on both sides of the river are lit up at 6 pm, with 19th century architecture on one side and 21st century skyscrapers on the other. Having received China Highlights’ pamphlets before your tour, you will recognize the buildings on the Bund and be familiar with their background and architectural history. 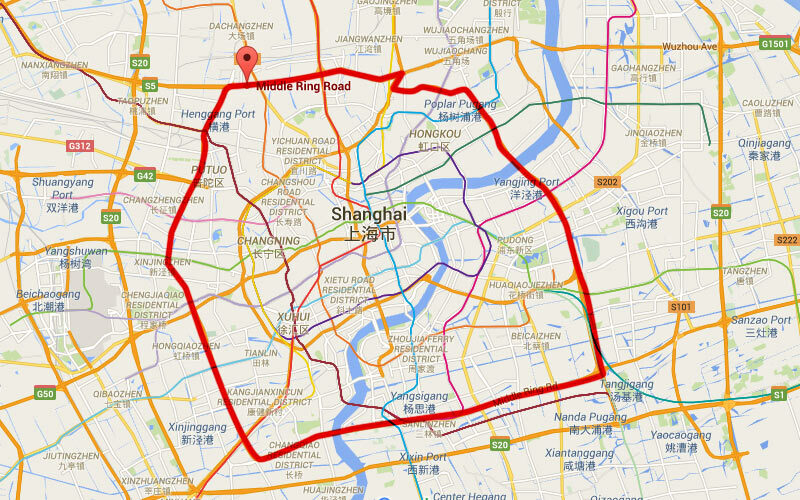 Returning to your hotel in Shanghai will normally take about 20 to 30 minutes. We will transfer you to your hotel at the end of the tour. If you need to catch a flight or a train after the tour, we will be more than happy to help you arrange it. Travel to a Shanghai train station would take about 20 to 30 minutes. Going directly to Shanghai Hongqiao Airport normally takes about one-and-a-half hours. 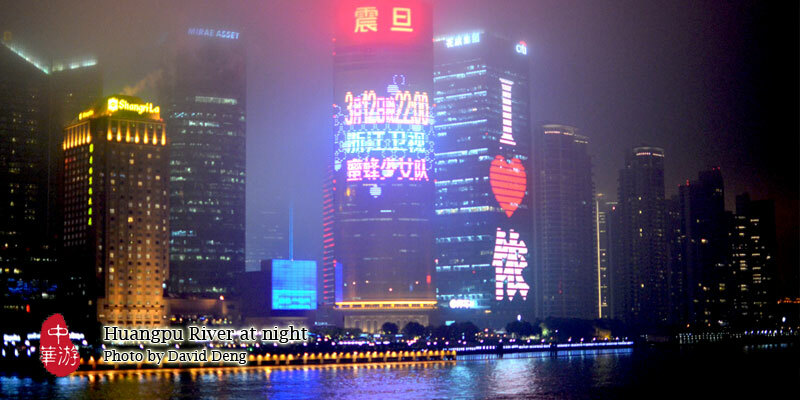 You should, however, allow 2 hours for going to Pudong airport from the Bund. 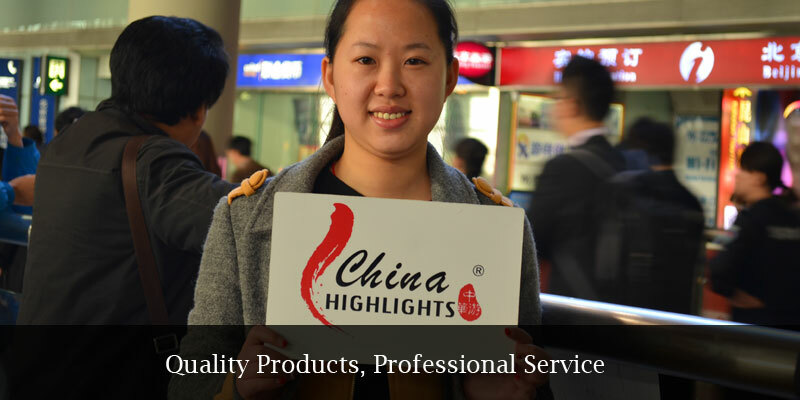 Thank you for choosing China Highlights. We trust this trip will be a wonderful experience for you and you will be completely satisfied. It would be a great encouragement to us, and we would greatly appreciate it, if you would rate us on TripAdvisor or share your experience of our service on your Facebook or blog. China Highlights prides itself on offering and conducting the best and most enjoyable, informative, convenient and comfortable tours in and around the beautiful, historic and vibrant city of Shanghai. We feel a professional obligation to conduct research and constantly monitor feedback and constructive criticism from our customers. We work out the best routes to cover Shanghai’s top sights and do our best to help you save time. 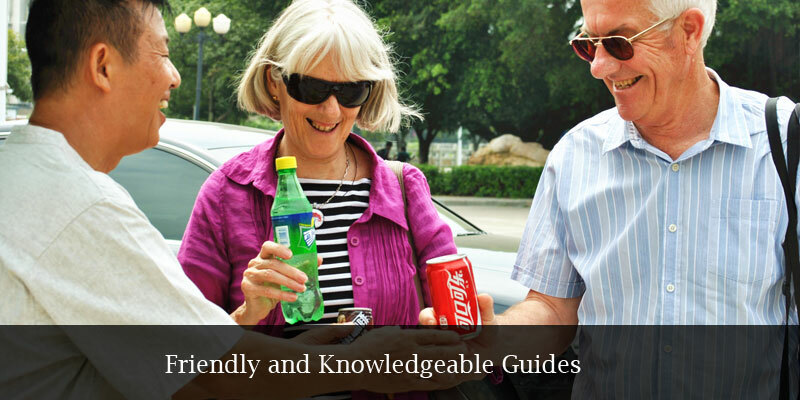 Our tour guides are friendly, knowledgeable, and well-trained. They only work for China Highlights. We do not employ freelance tour guides. Admission to Shanghai Urban Planning Exhibition Hall and Yuyuan Garden. 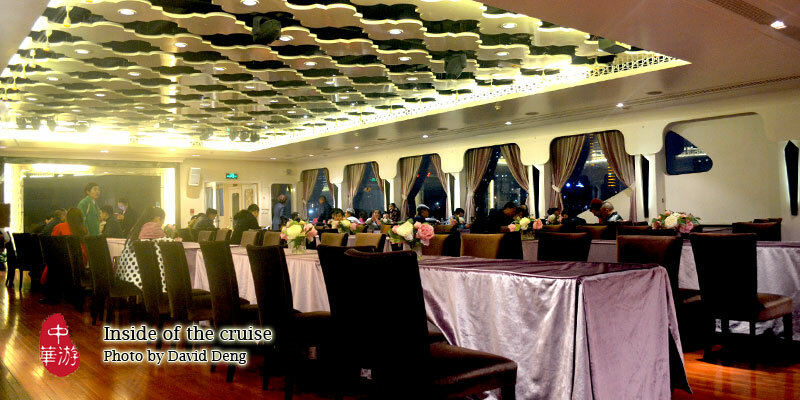 Ticket to Huangpu River Cruise. A walk tour Xintiandi and places near Yuyuan Garden. Set-menu lunch at a local restaurant in Shanghai. Gratuities to the tour guide & driver (usually CNY 50 - 100 per person for them). It is not compulsory but would be a great encouragement for them. The tour is available every Tuesday, Saturday, guaranteed departure.